NASA satellite imagery showed that Tropical Cyclone Nora developed an eye as it strengthened into a hurricane north of Australia. NASA-NOAA's Suomi NPP satellite provided forecasters with a visible image of the storm, formerly named Tropical Cyclone 16P. The Australian Bureau of Meteorology or ABM issued warnings and watches for Nora. A Warning Zone is in effect from the mouth of the Gilbert River to Thursday Island, including Weipa. The Watch Zone extends from the Northern Territory/Queensland border to the mouth of the Gilbert River. On March 23 at 12:36 a.m. EDT (0436 UTC) the Visible Infrared Imaging Radiometer Suite (VIIRS) instrument aboard NASA-NOAA's Suomi NPP satellite captured a visible image of Tropical Storm Nora as it continued moving between northern Australia and New Guinea. The image was created at NASA's Goddard Space Flight Center in Greenbelt, Maryland and showed an eye surrounded by powerful thunderstorms wrapping into the low-level center of circulation. 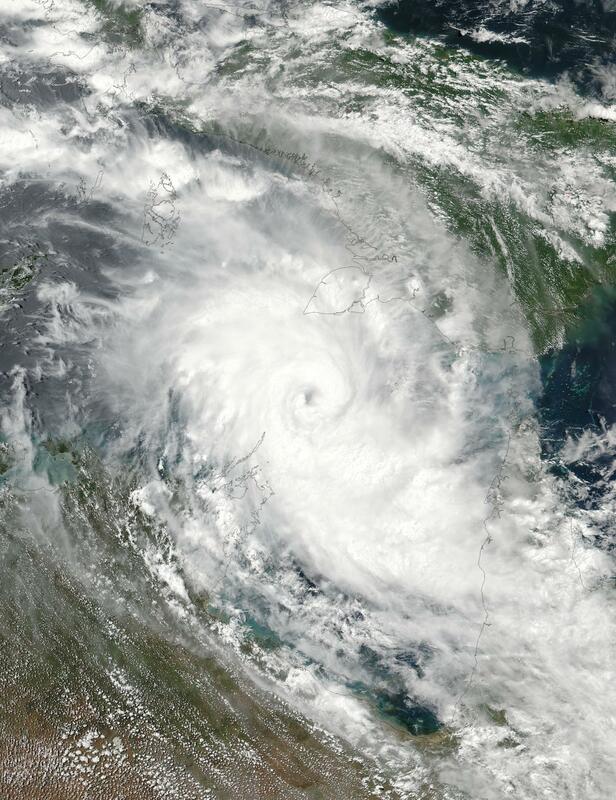 At 5 a.m. EST (0900 UTC) on March 23, the center of Tropical Cyclone Nora was 438 nautical miles east-northeast of Darwin, Australia near 11.0 degrees south latitude and 138.5 degrees east longitude. Nora was moving toward the southeast near 15 mph (13 knots/24 kph). Maximum sustained winds were near 75 mph (65 knots/120 kph) making Nora a Category 1 hurricane on the Saffir-Simpson hurricane wind scale. Nora is forecast to continue strengthening and moving southeast into the Gulf Carpentaria. ABM noted on March 23 "Severe Tropical Cyclone Nora continues to intensify as a Category 3 strength cyclone as it moves southeasterly across the northern Gulf of Carpentaria. The Tropical Cyclone is expected to reach Category 4 strength during Saturday while over the northeast Gulf of Carpentaria. On Sunday, the Tropical Cyclone is expected to take a more southerly track and move towards the southeastern Gulf of Carpentaria coast, although a coastal crossing anywhere along the western Cape York Peninsula south of Mapoon during Saturday afternoon or Sunday is also possible. By Monday, the Tropical Cyclone is expected to become slow moving over the southeastern Gulf of Carpentaria or inland of the coast." The Joint Typhoon Warning Center's extended forecast calls for Nora to approach Mornington Island on March 26 and make landfall in southwestern Queensland on March 27.